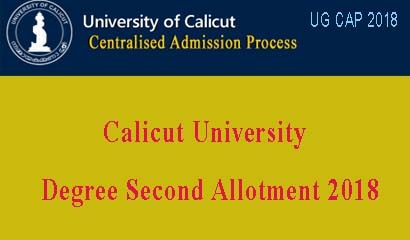 Calicut University Second Allotment 2018 has been released today 19th June 2018. All the applied candidates can check the degree second allotment result from the Calicut University admission web site. The Degree Second Allotment 2018 result is available on www.ugcap.uoc.ac.in. The candidates can login to the web site and check the allotment result. Calicut University Degree Second Allotment published on 19th June 2018 (19.6.2018). The Calicut University degree second allotment result published on university website www.ugcap.uoc.ac.in. The students may check the UG CAP second allotment result online. The allotted students should pay the required fee through cu web payment system to confirm their degree admission on or before 22/6/2018. The last date to remit the fee to secure the current allotment and admission is 22/6/2018..